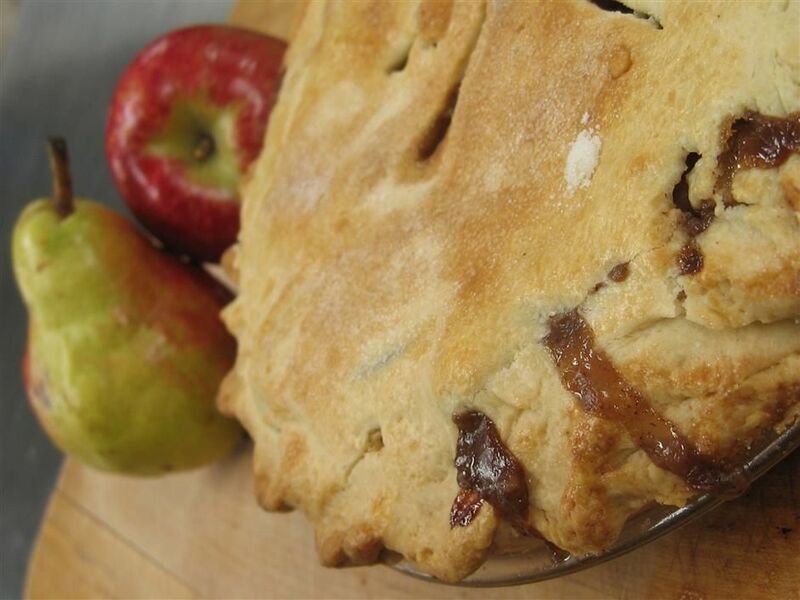 THIS pie showcases a great flavour combination – tart apples and sweet pears spiced with nutmeg and cinnamon. Preheat the oven to 190°C. Roll out half the dough and fit into a 25cm pie plate. Brush the bottom with the egg white and refrigerate. Mix applejack brandy if using, dried currants, fresh lemon juice and vanilla extract in large bowl. Let mixture stand 15 minutes. Cook 3 tbsp unsalted butter in heavy large skillet over medium heat until pale golden, about 3 minutes. Add apple wedges, ground cinnamon and ground nutmeg. Sauté until apple wedges are crisp-tender, about 12 minutes. Add apple mixture, pear wedges and cornstarch to currant mixture; toss to coat. Mix light brown sugar, corn syrup, whipping cream and remaining 2 tbsp unsalted butter in heavy small saucepan. Boil over medium-high heat until slightly thickened, stirring until sugar dissolves, about 5 minutes. Stir in chopped walnuts. Add to fruit mixture. Toss to coat. Transfer warm filling to prepared crust. Roll out the top crust and place on top. Cut slits in the top so the pie can vent. Bake 30 minutes. Reduce temperature to 180°C and bake until apples and pears are tender and liquid bubbles thickly, about 30 minutes longer. Cool pie on rack. Serve warm or at room temperature.